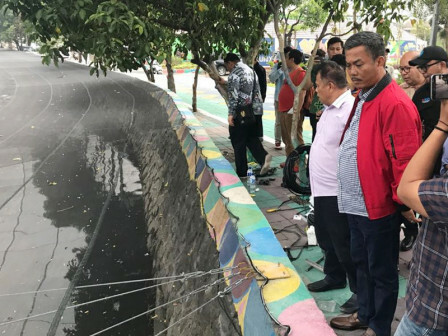 Jakarta Council (DPRD) Head, Prasetio Edi Marsudi, together with Council members visited Sentiong River, Kemayoran, Central Jakarta after conducting monitoring on Kalijodo RPTRA, Penjaringan, North Jakarta.
" We appreciate Mr. Anies breakthrough"
While viewing Sentiong River, he claimed to be satisfied with Jakarta Governor, Anies Baswedan hard work in minimizing pollutant levels together with Ciliwung-Cisadane Flood Control Office (BBWSCC). "We appreciate Mr. Anies breakthrough," he conveyed, Wednesday (8/1). "I try to eat on riverside and doesn't smell any unpleasant smell from the river," he conveyed. Though, his side reminds Jakarta Government to solve the root problem of Sentiong River after Asian Games. "The root problem has to be solved after Asian Games," he affirmed.